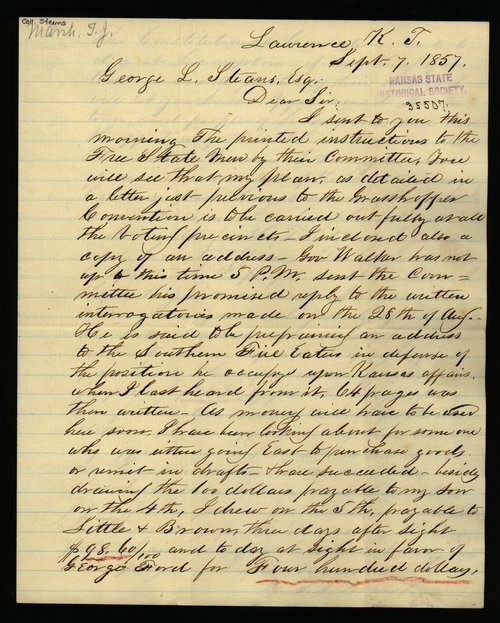 Thomas L. Marsh wrote this letter to George L. Stearns detailing the lack of response received from Governor Robert Walker concerning the territorial elections. He also expresses his anger over a speech that Walker was giving to the secessionist Southern Fire Eaters on affairs in Kansas, and mentions the people of Lecompton and their "Plantation Manners." The letter ends with an account of money paid in support of the Free State cause. A searchable, full-text version of this letter is available by clicking "Text Version" below. People - Notable People - Stearns, George L.